At this point of the season, you usually start to get a clearer picture on which teams will be playing in which division at the start of the next campaign. This year, League One sides have other ideas. With a maximum of 10 games left to play for each team this season, there’s only nine points separating Bradford City in rock bottom on 36 points, and Plymouth Argyle in 12th on 45 points. And with those from 11th place upwards fighting for at least a play-off spot, there’ll be no easy games up until the end of the season. Looking in-depth at the fixture list, are there any sides that have a more favourable run-in to fight relegation? With such a high number of teams fighting for League One survival this season, the run-in mainly consists for relegation match-ups. There are a few games between the bottom 13 and play-off hopefuls, as well as a handful of matches against the top five, but to avoid relegation, it’s crucial that the sides win their ‘relegation six-pointers’. With an impressive pick up in form since new man Wally Downes took over, AFC Wimbledon have gradually escalated themselves closer to safety. They’re just a win away from 20th place, though they’ll need a huge swing on goal difference to help. The Dons have eight games remaining, and crucially seven of those are against sides in and around them. They could be looked at as ‘easier’ games, but with a lot more resting on them, they’re never going to be easy. They’re 8/15 for a drop to the fourth tier. Bradford are six from safety, and five of their eight come against lower half teams too. If they can put a run of form together, they might fancy their chances of survival. It might be too late for them though, and our traders are saying they’re 1/6 for the drop. Rochdale also appear to be doomed, with two thirds of their games being ‘six-pointers’, there’s a lot of pressure on their shoulders to drag themselves out of the scrap. They’re 4/11 to lose League One status. 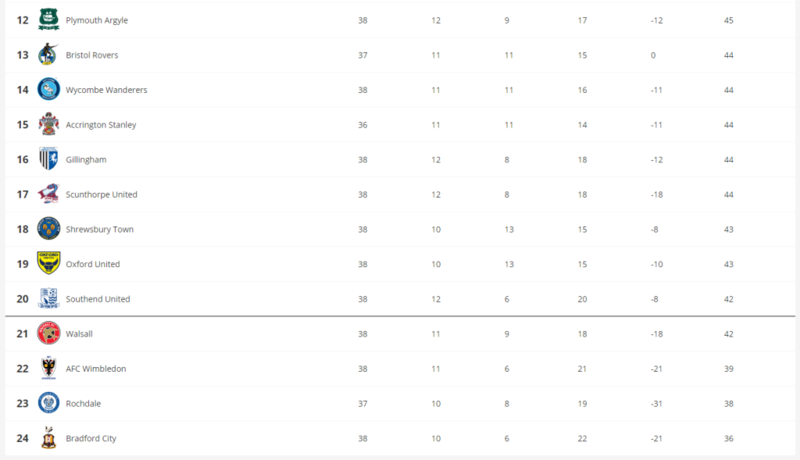 With those three odds on for relegation, it also looks like only one relegation spot is up for debate. Walsall and Southend are the two that are expected to fight it out to just avoid the drop, and 6/5 says the Saddlers will miss out over the Shrimpers, who are 11/5. Plymouth may just about be safe, and have a favourable run-in too. They’re 9/2 alongside Shrewsbury for the drop. Gillingham, Scunthorpe and Wycombe are still vulnerable at 4/1, especially The Chairboys, as they’ve lost five of their last six. Oxford United, Bristol Rovers and Accrington should all have just enough to secure the points needed to stay up. They’re 5/1, 8/1 and 11/1 for the drop respectively. How the EFL League One table currently stands. With five teams battling among themselves for the top five places in the division, sixth place is well and truly up for grabs. Currently in the hunt for those places are Doncaster Rovers, Coventry City, Peterborough United, Blackpool, Fleetwood Town and Burton Albion. Out of the 13 relegation battlers, only Rochdale and Wimbledon avoid having to face the play-off hopefuls. Two of the current bottom three swerve those tricky tests, with bottom club Bradford having an outstanding fixture with Coventry, who sit in seventh. The majority of the rest face one or two promotion battlers along the way. Southend and Accrington face the most matches against those fighting for sixth. Fleetwood, Burton and Peterborough stand in the Shrimpers way, though their own form needs to be the primary concern. Stanley face Burton, Fleetwood and Doncaster. Doncaster currently occupy the final play-off spot, and they’re favourites to keep hold of that come the end of the season at 2/7. Coventry and Peterborough are expected to battle hard for it at 5/1 and 6/1 respectively, though Doncaster do have a game in hand. Blackpool and Fleetwood are outsiders with a chance at 14/1 and 16/1, and Burton look to be out of the running, seven points behind sixth at 40/1. Luton Town, Barnsley, Sunderland, Portsmouth and Charlton Athletic are virtually guaranteed at least a play-off spot, barring complete capitulation in the season run-in. Matches against the top five won’t be season defining for the relegation strugglers, though it must be said that Gillingham did recently pick up a valuable point away to the league leaders last time out. Accrington and Rochdale face three of the top five. John Coleman’s side face Luton, Sunderland and Portsmouth, with The Dale up against Sunderland, Portsmouth and Charlton. The remaining relegation scrappers face one or two against the top five, but these matches could have more impact on the title race than relegation. Luton are hot favourites for the crown at 1/3, with Barnsley expected to be the side that are bringing the fight to the Hatters. The Tykes are 7/2 for the title, or 1/4 for automatic promotion. Sunderland and Portsmouth are outsiders for the title at 8/1 and 40/1 respectively, though the Black Cats are 8/11 for promotion and Pompey are 13/8. Though Charlton are 1/250 to secure a play-off spot, the Addicks are still outsiders at 3/1 for promotion. Click here for the latest League One odds.